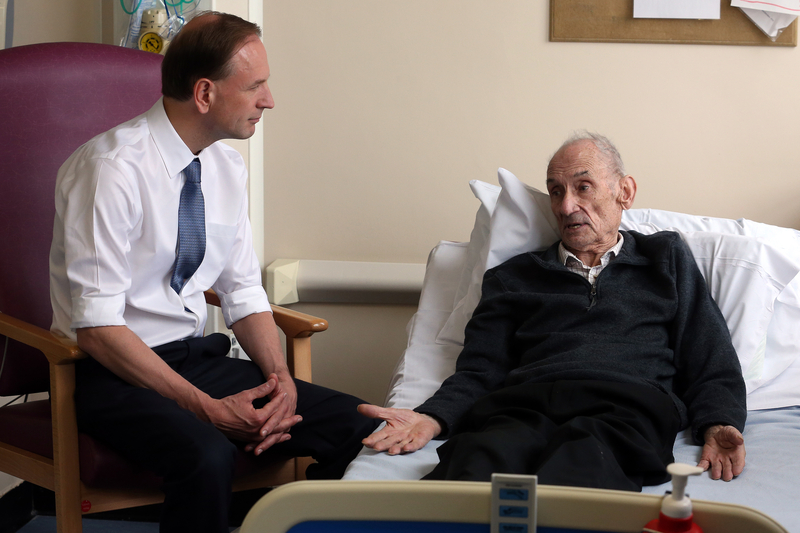 Brand new Chief Executive of the NHS, Simon Stevens, spent his first morning in the job meeting staff and patients at Shotley Bridge Hospital in County Durham. He started his career in the NHS as a trainee manager at the hospital over a quarter of a century ago. Mr Stevens visited the cancer unit and rehabilitation service where he spoke with doctors and nurses and asked patients about the quality of their care, and what their food was like. Mr Stevens said: “It has been wonderful to be able to start my time as NHS England’s Chief Executive at the hospital where I began my NHS career twenty six years ago and which taught me so much about healthcare. I trained as a S.R.N.at Blackpool Victoria Hospital from 1969-1971.I have been to visit patients many times recently.One of the main problems on the wards nursing Geriatrics is that the auxiliaries are not doing the job that they were intended to do-which is Basic Nursing Care and Observations. It is dreadful to see friends on wards not being given fluids,told that they can’t have a bedpan because auxiliaries are to busy and being left in soiled beds. Yes,do start at the bottom and give new job descriptions out to carers on wards. With respect to your influence, Simon Stevens, I appeal to you on behalf of those in need of organ donors to prolong life & ease suffering of the living, at home & away. At 72, I frequently visit Australian family, staying predominantly in their Perth home, covered by relevant travel insurance including emergency medical needs. I am told by Australian Medicare their organ donor scheme is only open to Medicare members, although they’ve reciprocal understanding with the UK NHS for visitors. Is it necessary for me to join Medicare, as well, should I die in Australia? As organs from dead donors may benefit suffering living individuals, I hope NHS reciprocal arrangement is extended to donors! This could benefit several of our families, friends and/or others in critical need in either country, if not in between! My family are respected, responsible Australian citizens in work, college & school, proactive in Perth and local community. I’m currently ensuring my affairs are in order to help my family on my eventual promotion to God’s Presence! PLEASE help us and the millions in similar circumstances by bridging this gap! May God increasingly bless you and all those you influence, at home and away! I would like Mr Stevens to tighten who is entitled to NHS treatment before admission. If not eligible a substantial deposit from a credit card should be taken as it is in private hospitals. Many years ago a large London hopsital was 10k for a weekend of cancer treatment. i would also like to see the NHS run a private scheme. I do not consider it has anything to lose in direct competition to the likes of PPP AVIVA BUPA. To keep it very simple based on age say £10 -£20 per month if you are in your twenties and £20 – £30 per month is you are in your thirties. Private bed allocation should be extra. Look at the revenue that would generate from private company insurance alone. I had private treatment a few years ago with an excess to pay so I know that it was over a year before the NHS billed AVIVA for my treatment, they shoudl have been charged a adeposit on the way in and a refund on the way out. Shame that when talking about preventable diseases on the BBC news, Mr. Stevens did not differentiate between Type 1 and Type 2 Diabetes. This perpetuates ignorance among the general public as to the differences and different causes making life more difficult to those with the Autoimmune Type 1 condition such as my 10 year old daughter dx’d at 7 months.